The Disability Resource Center hosted Disability Awareness Week at multiple campuses Sept. 17-20. 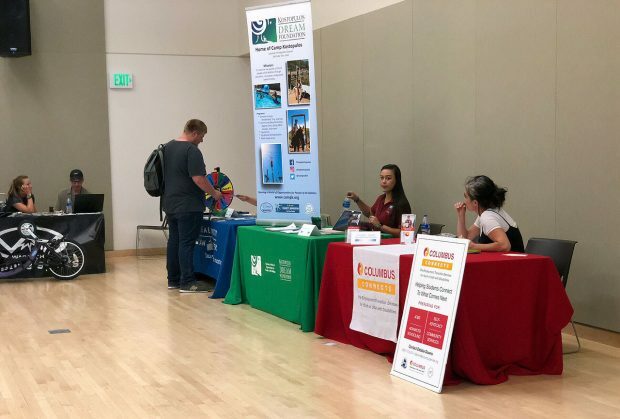 The weeklong series of events at Salt Lake Community College looks to provide several daily events and exhibits to showcase the idea that disabilities can be a part of many different people’s lives. “While we do serve many students with visible disabilities, the majority of our students have silent disabilities, which are ones that are not visible to everybody,” says accommodation specialist Jamie Bird. Along with showing the larger presence of disabilities in society, the events also serve as an advertisement for the DRC, to show that students with disabilities have a place to go, with an abundance of resources to help them. The first event of the week was the documentary screening of “Autism in Love” in the Student Event Center at Taylorsville Redwood Campus. This film was previously included in the Sundance Film Festival. The event had an inviting atmosphere, with pizza and drinks offered for attendees. The film showed the idea that love can be felt and expressed in different ways for people who are on the autism spectrum. “The film really opened my eyes to the different ways people with autism can express their feelings. It was also a very well-made documentary, it is very easy to see why it was included in Sundance,” says SLCC student Preston Truett. Overall, the film was well received by attendees, and served as an eye-opening experience to some who were unaware of how people with autism live their lives. The second event of the week was the Assistive Technology Fair held at South City Campus. This fair showcased many different forms of assistive technology which can be used by students with disabilities in the classroom and everyday life. Some of the technologies include the software KURZ WEIL, which works as a textbook and test reader, used by students with vision impairments. The fair also included many different types of screen readers and smart pens, some of which are available at the DRC. The third event of the week was a keynote speech by Stephanie Mathis, who serves as the executive director of the Sego Lily Center in Salt Lake City. Held in the Student Event Center, the speech was titled “Deaf and Dance” and detailed her own work with using dance as an outlet for people with hearing impairments. “Mathis wants to show through her own experience with hearing impairment, that dance can be an outlet, and that hearing-impaired people like to dance too,” says DRC administrative assistant Kirstin Hoyt. The speech was received well, and hopefully showed students living with hearing impairment a different outlet or avenue for expression. The final event of the week was a talk by artist Cara Jean Means. Her discussion was aimed at explaining the context her artwork series GRIP: Conversational Paintings on Mental Health, which was on display at South City Campus through Sept. 26. Means says the context for her artwork is a “removal of the faces people with mental health impairments wear, in an attempt to show their true emotions and feelings.” Along with the paintings were thought-provoking questions, to allow the audience to join in this mental health dialogue on their own. This artwork series works to remove the silence of these mental health issues and give a voice to those suffering. 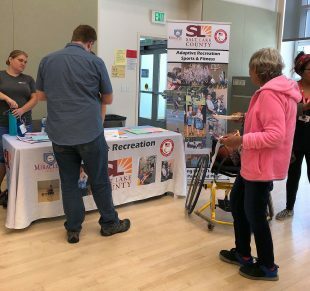 Overall, Disability Awareness week worked not only to change perceptions surrounding mental health and disabilities, but also give attendees outlets for expressions, and examples of resources available to them.